Manufacturing of FIRED BRICK starts with the grinding and mixing of the raw materials. The raw materials are selected and kept in a separator which helps in the removal of overaized materials. When the oversized materials are selected by the separator, A jaw crusher is then used to squeeze the particles left, keeping them in a smaller size. After the raw materials have been selected, different sizes of materials are separated by a screen.this leaves the raw materials in batches according to their specific sizes. Then materials with good sizes are sent to the storage silos ,the remaining oversized materials goes to the hammermil which pulvarizes the oversized materials. The oversized materials are putted into a pig mill with water. The pig mill makes use of knifes on a rotating shaft to cut and fold materials in a shadow chamber. The blend is then moved into an Extruder at the far end of the mill. The extruder usually consists of two chambers.The first chamber removes air from the ground clay with a vacuum which helps to prevent cracking and other defects while the second chamber compacts the materials so the auger can extrude it through the die. Sections of desired length are then cut to size with the knives and stiff wires. The bricks now need to be molded.in molding the bricks ,wet clay is shaped and arranged in a wooden mold,the interior of the wooden mold is usually coated with sand in other to provide the desired texture and makes it quicker while removing the formed bricks from the mold. Cold water can also be used to assist the release of the bricks. Then the bricks are presed. 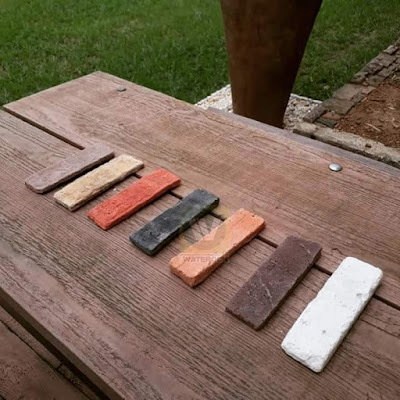 Pressing the bricks requires a wet material.this material is placed in a die and then compacted with a steel plunger which has been set at a desired pressure. The brick is then indented with machines called CHAMFERING MACHINE which helps to produce a furrow in the bricks. After the desired brick shape and size has been produced, the product is then taken to a furnace where they are heated to harden accordingly. This is a very brief account of how bricks are made, elaborate professional materials can be sourced from appropriate research libraries on brick making.